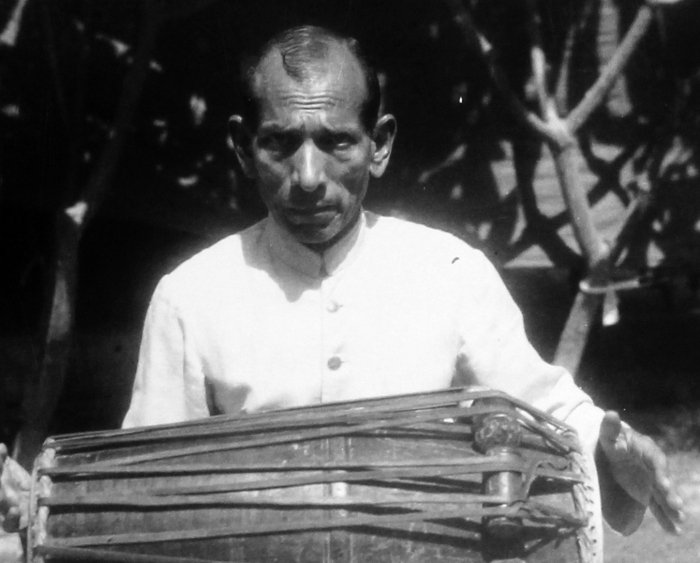 Rahim Fahimuddin Dagar would often talk of pakhavaj accompaniment that follows the angs of singing, for improvisation in dhrupad compositions is a demonstration of the facets or angs of the raga within the constraint of the lyrics of the composition and the structure of the tala â€“ its inner subdivisions and points of emphasis â€“ the tali and khali. He would praise the accompaniment of pakhavaj players like the famed Ayodhya Prasad and Govindrao Burhanpurkar with his father that he heard in his youth. Here is an example of the kind of pakhÄ�vaj accompaniment he talked about â€“ most probably by Ayodhya Prasad. A very perceptive account of his pakhÄ�vaj playing is given by S. K. Choubey in his essay â€“ Pandit Ayodhya Prasad in Musicians I Have Met (Uttar Pradesh State Publications Department 1958). This and other essays in Choubeyâ€™s book are also examples of the kind of critical writing on art and the discussions that went on in musical circles in the pre-Independence era when people freely expressed their opinions and an article on a musician or a performance could also be a critique of some or all aspects unlike articles now which merely express banalities and fulsome praise. I have dealt in detail with many of these aspects in my book Dhrupad of the Dagars â€“ Conceptual Foundations and Contemporary Questions, which is about to go to the press.